Malaysian rejoiced last month when Netflix announced that they would be coming to our shores. We were all salivating over the massive amount of content we would finally have access too…except that it wasn’t so massive. Malaysia would enjoy less than 20% of what was available to Netflix users in the US or even in the UK, and that looked like an especially lousy deal since we were paying the same amount for our subscriptions. I wasn’t that interested in the news, after all, I had already subscribed to Netflix for more than 2 years, and used a VPN to enjoy US and even UK content. I loved Netflix because it had a lot of interesting content, but what really sealed the deal for me was Pocoyo and Dora the explorer…I’m a father of a 2-year-old, and having a video on demand service that lets me address my toddlers demand was a life-saver. Netflix was far more effective than youtube for videos for my kid, first of all, the content was pure, and I could be sure that nobody was messing with it or adding commentary, but more importantly, it had no adverts, and when you have a 2-year-old the last thing you want them to watch is adverts. But alas, the good days are over. Soon after announcing the Malaysian launch, Netflix also announced that it was clamping down on VPNs accessing the service, and yesterday I experienced first hand that effect. I couldn’t watch Netflix from my VPNs UK exit node, which in turn made me unable to watch Pocoyo or Dora, and my personal favorite–The Good Wife. So with my daughter throwing a temper tantrum, I resulted to youtube. Obviously, that was a temporary measure to stem the short-term disaster, but trust me I will not be relying on Youtube for my video on demand, it’s too jam-packed with ads to be good for children. A quick Google search revealed that iflix has Dora, and The Good Wife, so that’s good news. But it doesn’t have Pocoyo–what’s a guy to do. Download of course, through torrents, only this time, I won’t feel a hint of guilt. If the copyright holders make it impossible for me to purchase content, don’t act surprised when I pirate it. I can’t buy Pocoyo in Malaysia (easily! ), and hence I’ll just torrent it and watch it offline. After all, if a legal purchase isn’t plausible, then the entire argument that illegal downloads represent ‘lost-income’ for the copyright holders won’t hold anymore. You cannot lose income over something you never intended to sell. A lot of people don’t agree with me, but that’s because they’re using physical-world analogies for the digital world, and that doesn’t make sense. If you have a car, and I steal it, I gain a car and you lose a car. It’s a zero-sum game. 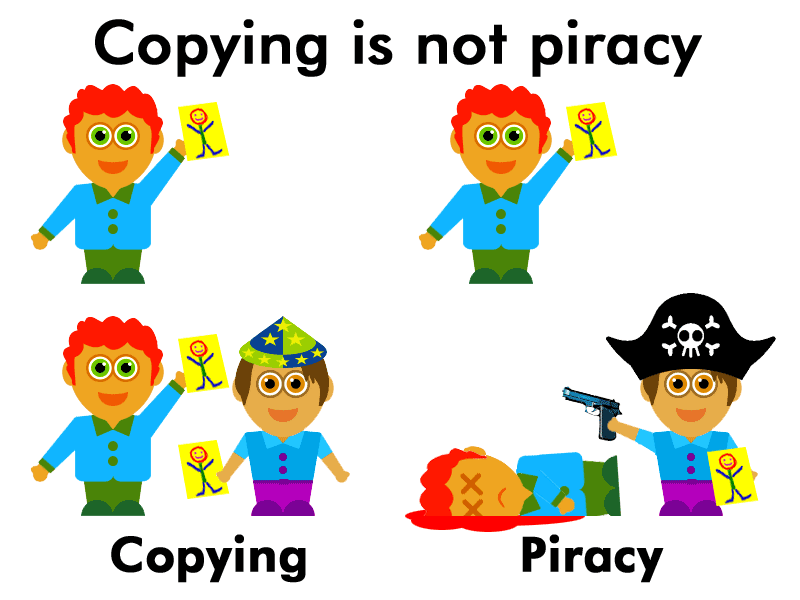 Stealing is zero-sum but downloading can’t be stealing. If you produce a song, and digitally hold it, I can copy that song while you can keep your original. It’s not zero-sum. ‘Illegal’ downloading isn’t akin to stealing, it’s more like trespass. Where I’ve used a little bit of your land, but you still own it. I haven’t decreased the value of your line by trespassing in a similar way that I haven’t taken anything from you by downloading your song ‘illegally’. In other words, I can gain value without you losing it. Most will scream that I’m denying the ‘artist’ income, failing to understand that ‘artist’ rarely get good deals from the record labels (how else do you explain P. Ramlee dying a bankrupt), and, more importantly, I can’t deny the artist income if the Artist never intended to sell to me. Netflix users in the UK get to watch episodes of Pocoyo, while me in Malaysia can’t. I don’t have any VOD services that provides it, and my local branch of Speedy doesn’t sell it either. The closest I can come to procuring it legally it is buying a DVD set from Amazon, which cost a pretty penny even before you include the USD30 shipping, and no one can guarantee that I won’t need to go to KLIA if the shipment gets stopped in custom for any reason. How can you justify it being so convenient (and cheap) for UK users, while being such a hassle (and expensive) for Malaysians to procure the exact same content? That’s discrimination isn’t it? So…..I’m sorry, but I can’t feel guilty downloading ‘illegally’ when there are no realistic ‘legal’ options. Finally, blocking VPNs affects my security. Even if I wanted to access just Malaysian Netflix content, I’d have to turn off my VPN (since my VPN doesn’t offer a Malaysian exit node, and using a local node kind of defeats the purpose of the VPN) to watch Netflix. Turning off a VPN for any reason, puts my traffic in the clear as it transverses the deep dark corners of the internet, and that’s not a security minded thing to do. More and more people will be switching off their VPN to watch Netflix, and that’s going to reduce the overall security of the internet. Netflix are kowtowing to the copyright holders, but it won’t necessarily hurt Netflix, it will hurt the users who instead of opting for legal streaming options are going to fall back to tried and tested torrents for their content. Which will lead them to dodgy torrent sites that host dodgy content and possible mal-vertising as well. In other words, users are going to go back to torrenting, turn of their VPNs, visit dodgy torrent sites and still ‘pirate’ their content without giving a single cent to the copyright holder all because of this. It’s a lose-lose-lose scenario. And the Copyright holders only have themselves to blame.